Mike Welchnyski oversees the care of hundreds of animals at the Spirit of the Hills Sanctuary in Spearfish. Several animals are used for a living nativity each Christmas season in the sanctuary's barn. South Dakota Magazine photo. Mike Welchynski's Spirit of the Hills Wildlife Sanctuary celebrates the season each December by hosting a living nativity in Spearfish each evening from Dec. 18-24 in the sanctuary's barn. Guests are welcome to mingle with the animals while enjoying creamy hot chocolate. The sanctuary is home for a variety of species, from African lions to potbellied pigs. Around 60 animals and 20 people comprise the cast for the Christmas nativity, and several of those actors and animals appeared in the original Passion Play that helped bring Welchynski to Spearfish. For many, a visit to the sanctuary is a holiday tradition. "People can come to know the animals by name and love them, and they were someone else's throwaway," Welchynski says. The story behind the animal sanctuary is as touching as any holiday story we've heard. We published a feature article about the sanctuary in the Nov/Dec 2007 issue of South Dakota Magazine. 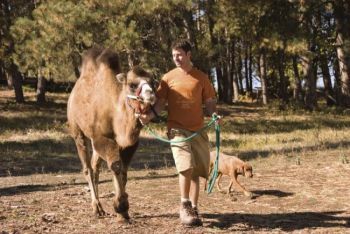 Paul Higbee, the author, lives in Spearfish and his wife, Janet, was a volunteer at the sanctuary. In 1998, Welchynski lived in Canada, his home country, providing care to people with disabilities and running a small animal sanctuary in Manitoba. Then he met husband and wife Johanna Meier and Guido Della Vecchia of Spearfish. They were on tour in Canada with their Black Hills Passion Play. The couple told Mike if he wanted to expand his sanctuary they would donate land in South Dakota because they admired what he was doing. The Meier family had property south of Spearfish that included pastureland, pined hills, a deep Black Hills gulch, a stream, pond and a cabin. Welchynski agreed it was the perfect setting. "I came to Spearfish and smelled the pines, and I knew this was a place that would sustain me physically and emotionally," he told Higbee. He moved to Spearfish in 1999 and began preparations for Spirit of the Hills. Around 300 animals live at the sanctuary, and he plans on taking care of them for the rest of his life, without pay. He uses donations to pay for food and care for the animals and is grateful for volunteers who help with manual labor. "I want this place to be a permanent institution for those kinds of animals, and I want it to be here long after I die," Welchynski told us. He also believes it is important to educate the thousands of kids who visit the sanctuary on field trips. He worries that more and more youth are isolating themselves from the lessons that only nature holds. Although Welchynski rarely discusses his past, he grew up in rural Manitoba in a situation where, at times, his best option "was to go to sleep with the sheep and pigs, or out in the woods for a few days." And today Welchynski is giving back to nature, a place he once found refuge. The hardest part of running the sanctuary is relying on the uncertainty of donations to care for the animals. If you'd like to make a donation this holiday season, or get directions to the live nativity, visit www.spiritofthehillssanctuary.org or call (877) 761-7754.